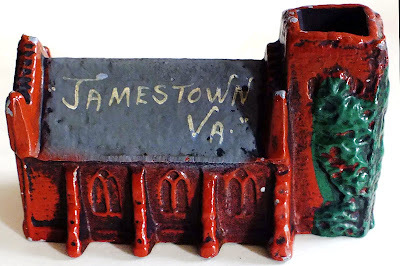 Back in 2009, reader of this bog and fellow collector, Scott D., wrote an item about his architectural souvenirs from Jamestown, Virginia. He recently found an additional building for his collection from that settlement - the Jamestown Church, seen above. Scott said, "It looks like it is made of lead. It is 1.5" high and 2.5" long and just over an inch wide." It's painted red, gray and green and has the words, "Jamestown, Va." hand-written on the roof. Nice find, Scott.